A convertible model is expected to join the BMW 8 Series family after the Coupe launches next year. BMW enthusiasts have been celebrating the announced revival of the beloved 8 Series luxury grand tourer. A concept model previewing the design of the final production model is being showcased at this week’s Concorso d’Eleganza Villa d’Esteset in Italy, paving the way for the final production model in 2018 to become the new flagship BMW. After the Coupe, the 8 Series family will be further expanded with a Convertible, a Gran Coupe and a long-awaited M8 performance model. Talented rendering artist Jan Peisert recently envisioned the latter with a bold and beautiful design. We expected him to follow it up with an 8 Series convertible render, but X-Tomi Design has already beaten him to it. Using the Concept as a reference, X-Tomi Design has produced a design showing us how the 8 Series could be adapted into a convertible, and it’s safe to say it looks just as stunning as the Coupe. It’s presented in a Valencia Orange finish, but otherwise looks near identical to the 8 Series Concept, sporting the same long hood, muscular wheel arches and 21-inch wheels. BMW has yet to reveal any specifications for the new 8 Series. However, Senior Vice President of BMW Group Design Adrian van Hooydonk has dropped a few hints. He describes the new 8 Series, which is essentially a coupe version of the 7 Series, as a "full-bodied high-end driving machine," and a "luxurious sports car which embodies both unadulterated dynamics and modern luxury like arguably no other." 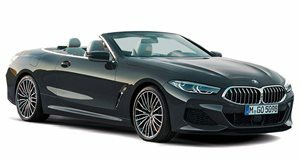 No doubt a convertible 8 Series will allow BMW to branch out its assault on the luxury car segment and catch up with Mercedes.